A patio pergola offers two things. The first is shade. the second is architectural interest on another level...which is overhead. And everyone seems to love them! But a pergola does not have to cover the entire space. For maximum shade you may want to do this, but you can also just install a wooden pergola in a particular area. A pergola can be attached to your house and still allow part of the patio to get some sun. I can also be near the house bur be completely free-standing...in other words, not actually attached to your residence. It can also be located further away along the patio perimeter. Above is one of the backyard landscape plans I did for a client in New Jersey. As you can see, the pergola extends along three sides of a bluestone patio. However, the center area is not open but covered by a continuation of the pergola structure in a more open pattern to make it unified. This allows for both shady and sunny areas for sitting and dining. There is also an outdoor kitchen island. It fits nicely under the pergola and has stools for great social conversation with the cook. Learn more about the . There is also a beautiful pond with two waterfalls nearby to enjoy while sitting on the patio. Here is a video I created of the entire backyard landscaping project. 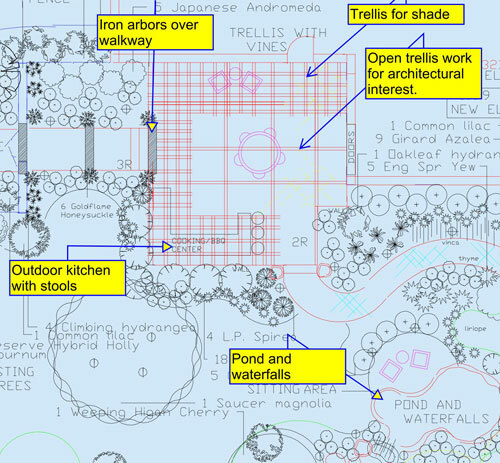 As sometime happens in landscape design, plans are not followed...or I should say that they are adjusted. The clients chose to create a more elaborate wooden outdoor pergola by having the entire structure be a pergola, complete with iron work. While I designed three iron arches with vines over the walkway leading to the patio, they decided to carry the same woodwork of the structure to tie it all together. Do I like my design better...probably. However, the landscaping is still very inviting and beautiful. The steps that you see in the above video lead down to a pool area, which can be seen from every area of the yard. All in all...a very striking project!